…moved out recently, though she’s always nearby and vigilant. I knew that her moving out meant the box has become too crowded with owlets. Daddy Owl keeps watch either in the Mountain Laurel tree or in a neighbor’s tree. 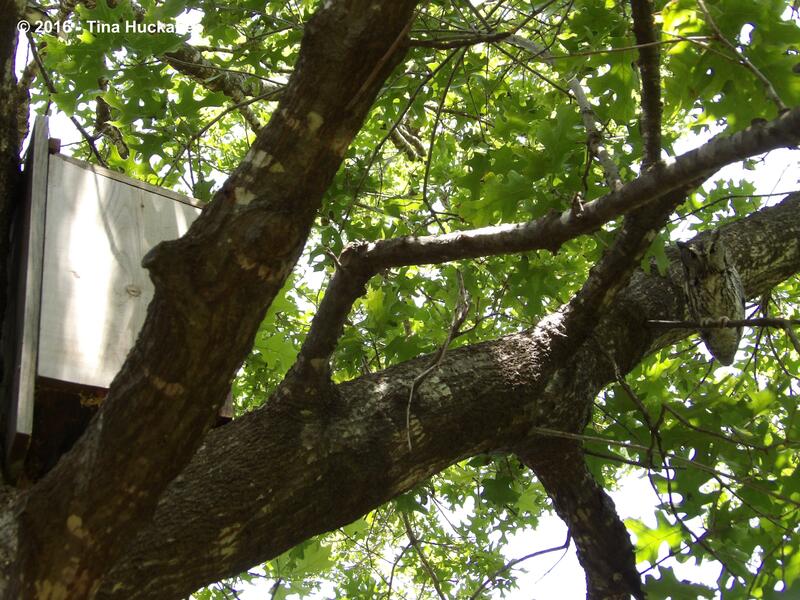 …but also on the shenanigans of squirrels and blue jays. She’s a beautiful bird, though I wouldn’t want to be at the caught-end of those talons. Mama laid their first egg on March 6, the other 4 followed on an every-other-day schedule. I assume that all have hatched and today this little cutey made his/her first appearance in the big, wide world. Watching this new chick was smile-inducing and a nice gift to me today. 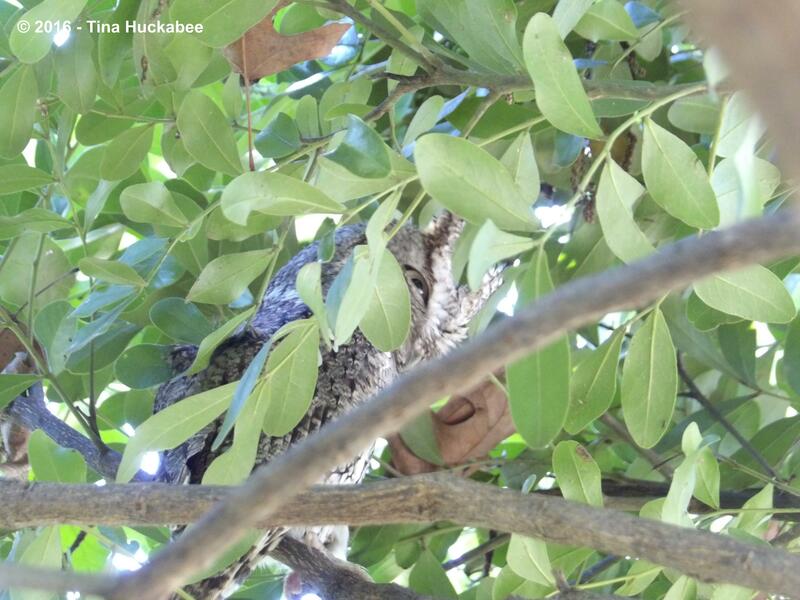 This owlet is too small yet to be out of the box and in the tree, so I hope its siblings don’t inadvertently push it out–that has happened to other owlets that we’ve hosted in the box(es). This little one was very curious about a new view of the world, but can’t fly, nor would it survive a fall from the box. Welcome little owl–and be careful! 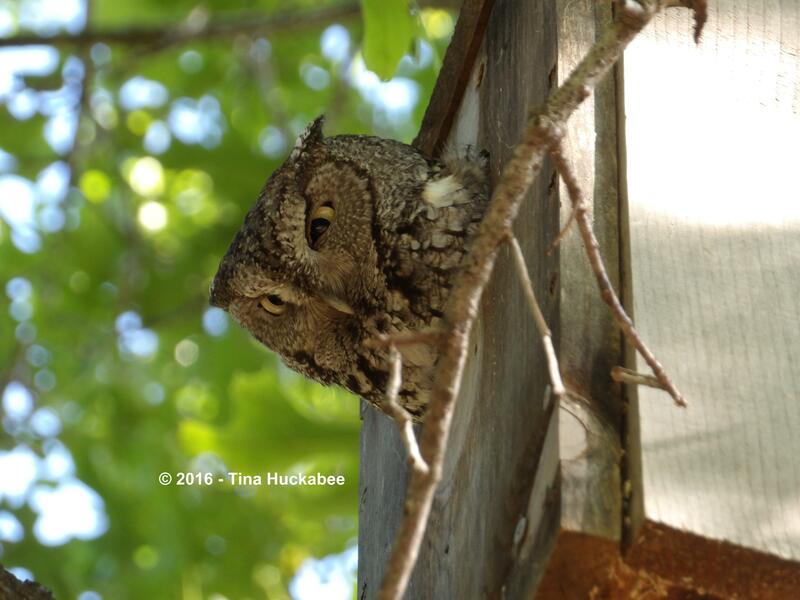 This entry was posted in Backyard Birding, Eastern Screech Owls, Uncategorized, Wildlife Gardening by Tina. Bookmark the permalink. Oh Tina, wonderful news! Great photos, the new owlet is much fluffier than I had imagined, I hope all goes well and they stay safe until ready to fledge. I bet you must be tickled pink with your new arrivals. Isn’t it?! It’s a hard life out there, so all I can do is hope for the best. I have to admit that I’m a bit nervous about this little fella, just because it’s not particularly shy about me making kissy faces at it and it’s hanging out of the hole too much for my comfort. Perhaps Mom and/or Dad will have a talk with baby tonight about safety. 🙂 The owlets are really fluffy–so, so cute! What a great experience. You must have a good view to get those photos. How big is the adult owl? 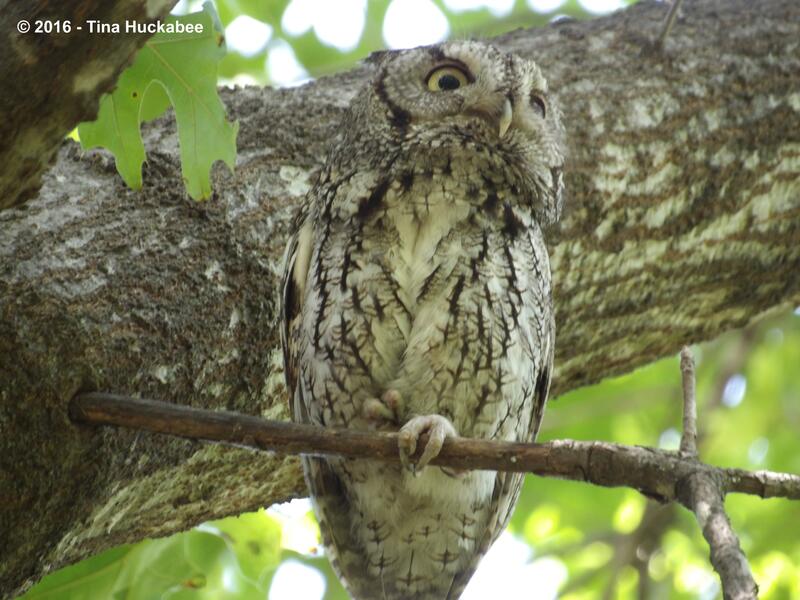 Screech Owls are teeny little owls–about 6 inches tall for the adults. The owlets aren’t much smaller at fledging time, but they don’t get their adult feathers until a bit later. I thought they looked very small. I have Barred Owls, which are really big. They live high in the trees behind my house. Oh, they are so cute and fluffy. Just a bit too curious for its own good, stay safe little owl! Aren’t they darling?? You’re right–this one isn’t as cautious as he/she should be. In nature, it’s best to be wary, not daring. I love it too–so interesting and fun. Thanks, Beth. Fluff-ball is an appropriate description. Thanks for sharing your brilliant photos. It must be a temptation to just watch the box all day. Thanks, Christina. It is a great temptation–I run out every chance I get to find Mom and Dad and now, Baby–who I can’t find this morning, but I’m sure is higher in the tree. I’ll keep looking! What a joy to see! I have never had the luck to see a baby owl as close before. Thanks! You’re very welcome! It’s a real gift to have these shy, elusive birds in the garden. I do feel very fortunate, indeed, Cathy. Fuzzy-Wuzzy made me smile, too. So adorably cute! Baby owls will always bring a smile. What wonderful fun to have happening up above in the canopy over your gardens. I too would have a hard time not just sitting and watching all the live long day. Such adorably fuzzy distractions! No flower could possibly compete with those feathery faces. Looking forward to more reports on their shenanigans as the little owls begin to explore their world further. Oh – please don’t restrain yourself on our account! As the comments attest – everybody is love-love-loving your owly tales! Gorgeous! I love owls and have had the privilege to see two close up, one here in our garden, one in my family home – in a tree just outside the sitting room window one evening, but it’s fairly rare here to see any in daylight. And I’ve never seen any owlets except in photos. You’re so lucky! I do feel so fortunate, Val. 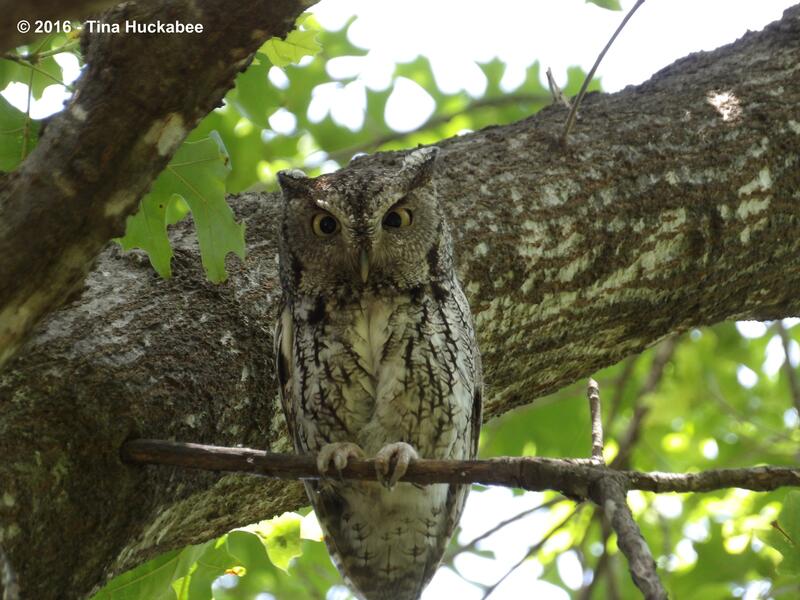 They’re so interesting to watch, the Screech Owls. Each year has been a bit different and I’ve learned so much about their habits and lives–a real education. This is fantastic news. Your photos are a delight. (Love the one of the Mama watching for squirrels and bluejays). Hope that all goes well with the new fuzzballs leaving the nest. 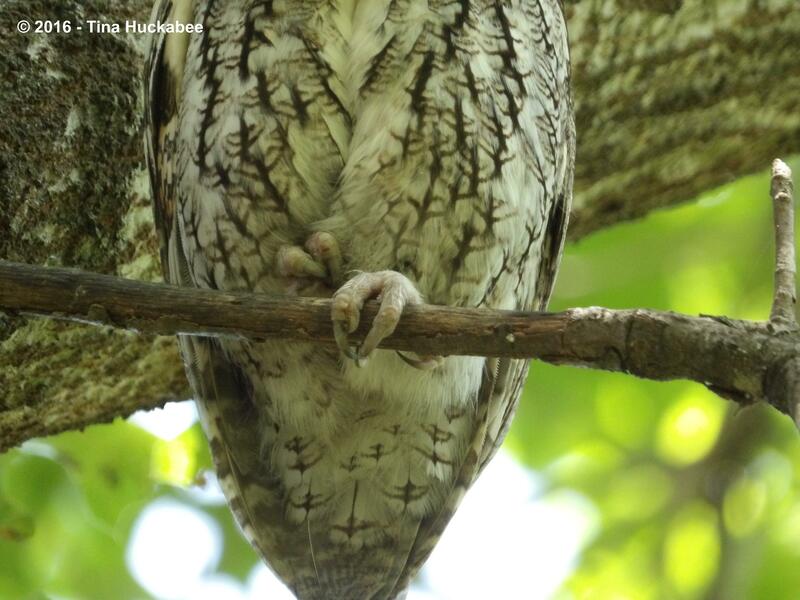 What is a normal success rate for screech owlets reaching adulthood? It is good news, though I haven’t seen baby today. These little things can blend in quite well. They are little fuzzballs, aren’t they? I think their lives are rather short lived, though I suspect that this couple may be the same couple from last year. 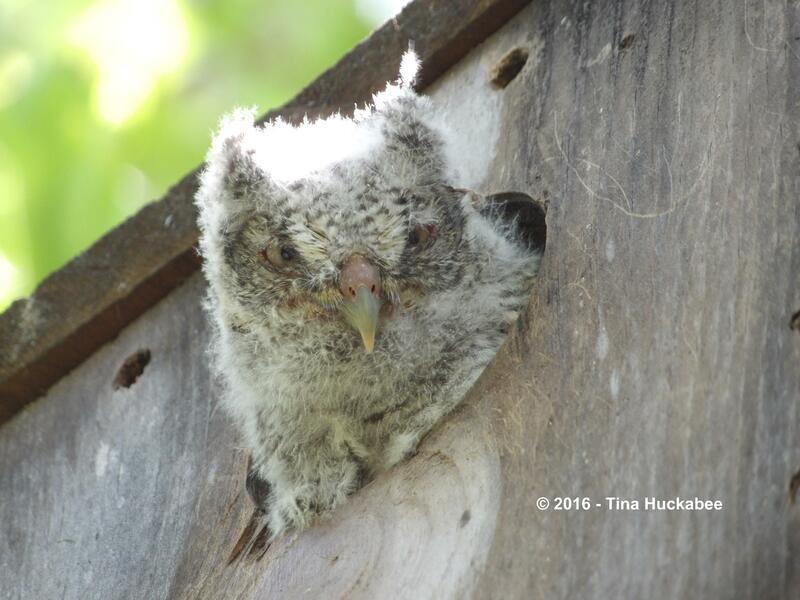 One of the articles I read once about Eastern Screech Owls stated: live hard, die young. There were five eggs and I don’t know how many have hatched or how many will leave the nest box. If all survived the fledgling period, my guess is that only one or two would survive to sexual maturity. It’s a tough world out there, though they are highly adapted to urban life. 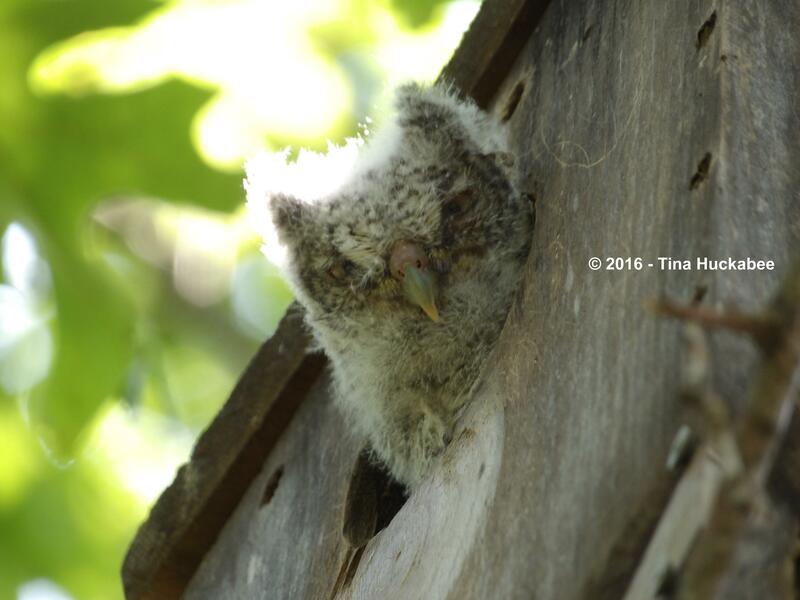 Thanks, Linda–the owlets are darned cute!! Oh, could you please fix up a hammock or safety net or something under this dear little thing?! Haha! That’s a great idea. I was fortunate to watch baby leave the nest box just after sundown last night. I’ve never witnessed that before. Daddy flew to the babe with what looked like a worm dangling from his beak. He trilled at the baby and baby hopped right out and onto a branch. I watched the baby until about 9pm last night. I’m fairly sure that baby is in the tree, because mama is watching nearby, but I haven’t been able to see baby yet today. There are no other fuzzy faces looking out the window today, though. Maybe tomorrow…. This is delightful to hear – please keep us all updated with the continuing progress of the fuzzy faces! So cute! Hello, little owl! I’ll pass on the greetings!! Adorable! Maybe is the oldest one; I really hope they all will do well this year! I imagine this is the first hatchling–that would make sense, wouldn’t it? I hope they have lots of mousies to catch!